I would like to cover some of the more common problems that occur while breeding finches. Most all problems are preventable or at least fixable. Let's start with some health problems, one of the more common is egg binding, which you can learn more about in my article: Egg Binding. Once you get past the egg laying part of the breeding cycle the next area you may run into problems is during the incubation. Dead in the shell occurs when the developing embryo dies before it hatches. The eggs getting too cold usually cause this. Many finches will jump from their nests while you are changing the food and water in the cage, if they don't return to the eggs shortly after you have finished the eggs may become too cold and die. It's best to take care of the daily cage maintenance as quickly as possible. Then leave the area to give the finches time to settle down. The next thing to watch is the development of the chicks. Failure to thrive simply put means the chicks die before they reach adulthood for no obvious reason. A closer look at these sickly chicks will usually reveal that they are under weight, thin, and over all much smaller than other chicks their age. The most common cause of this is inbreeding. If your breeding pair raises several clutches and most; if not all, the chicks die at a young age you should find new mates for the pair. Other common causes are bacterial infection, protozoal infection or parasites. 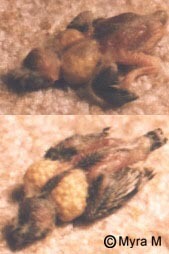 Bacteria and Protozoa that wouldn't effect an adult finch can have detrimental effects on the chicks developing body. The only way to test for these is to visit your local avian veterinarian. You should always quarantine, or have vet checked, new finches before introducing them into your flock, you can't always see everything they may be bringing with them. If your chicks may have a bacterial or protozoal infection you will need to treat them and their parents to prevent future problems. I suggest you use a general antibiotic such as Amytl and later administer a little Probotic or Guardian Angel to help rebuild the birds systems. Use Ronivet-S for protozoal infections. For more information on Failure to Thrive please click here. Behavioral problems can be the most frustrating. You can't teach a finch what to do but you may be able to help the finches through their trouble areas. An over zealous nest builder will either bury the eggs or build the nest up too much if excess nesting material is made available. Many finches, both male and female, can get a little too excited about nest building and forget to stop when the eggs are laid or build it so high the eggs will roll right out. There isn't much you can do to teach the finches to stop building, but you can be sure they don't have access to more nesting material once the nest is finished. Nest thieves take over a nest site from another pair, usually during the end of the nest construction stage but some will harass a nest owner even after the eggs have been laid until they give up the nest. Common nest thieves are Zebra and Society finches, which is why they should never be housed in close quarters with smaller more timid species. Of course, if you house your finches one pair per cage then nest stealing isn't a problem, but it can be a problem in an aviary setting. There are species that may act like nest thieves because they can be seen entering another species or pairs nests but they are not there to take the nest. They are parasitical breeders; they will lay their eggs in another pairs' nest to let someone else raise their young. These natural foster parents are never the wiser and the parasitical breeders are free to lay more eggs in another finches' nest. When a finch abandons the nest it's usually the result of distractions around the nest. The pair is spooked from the nest and won't go back. It's instinctual to build the nest in a safe location for the survival of the chicks and the parents. Once a pair decides a location isn't safe anymore they will abandon it. Another cause can be inexperienced breeder pairs. As a rule I will not bother a new breeding pair until after their first clutch is out of the nest for fear of them abandoning the eggs or tossing the tiny babies. Chick Tossing is frequently a problem with Gouldians but any species can and may toss their young for a variety of reasons, the most common being they are disturbed too much. Hanging around the cage, checking on the babies several times a day will rattle many finch parents, especially if they are first time parents. Other finches toss because they really don't know what to do with the little wiggling babies. Most finches will figure out how to properly care for their young even if the first clutch dies or gets tossed, but not all. The habitual tossers have led many breeders to use Foster parents to raise the young. Fostering does have it's advantages; it's possible to produce more babies in a single breeding season, and it allows breeders to continue breeding some of the more difficult species. As for the draw backs; fostered chicks may not recognize it's own species as breeding partners as they have imprinted on the foster species; the chick tossing pair isn't always given the chance to learn to raise their own young. For more information on Chick Tossing and Nest Abandonment please click here. The aggressive mate may be either the male or the female; I've had both from time to time. The aggression may be as simple as little chasing or beak pecking. 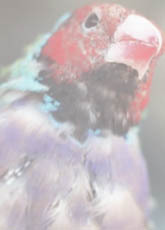 Neither usually results in harm to the other finch but the aggression can get worse. Fighting can escalate to plucking, biting, and even killing the mate and/or the chicks. The only thing you can do to an aggressive finch is to remove it from your breeding program or find a new mate that the aggressive finch isn't aggressive towards. Over all the years I've spent helping people to deal with their finches' problem, one of the most common problems I've heard isn't really a problem at all. A stuffed crop, one that looks so full it could burst is pretty normal. I have never heard of a crop actually bursting because the parent finches over-fed the chick. I know it looks bad and very unnatural but it's not a problem you need to worry about. After so much food is packed in the chick won't be able to lift its own head to beg for more until the crop empties more. Most problems can be dealt with easily with a little common sense. It's important not to panic, but to act quickly. Either consult your avian vet or your local finch breeder for advice.